Ginger produces clusters of white and pink flower buds that bloom into yellow flowers. Because of its aesthetic appeal and the adaptation of the plant to warm climates, ginger is often used as landscaping around subtropical homes. It is a perennial reed-like plant with annual leafy stems, about a meter (3 to 4 feet) tall. 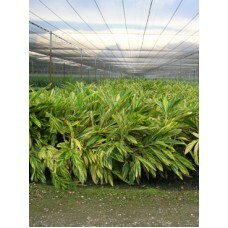 Variegated shell ginger is a tall and dramatic landscape or container plant. The leaves are about ..